Welcome to SecuSafe Pty Ltd.
Nowadays, video surveillance not only enables people to be safe but also enhances business efficiency. Especially store manager who concerns how to manage customer flow smartly and how to protect people’s safety efficiently. 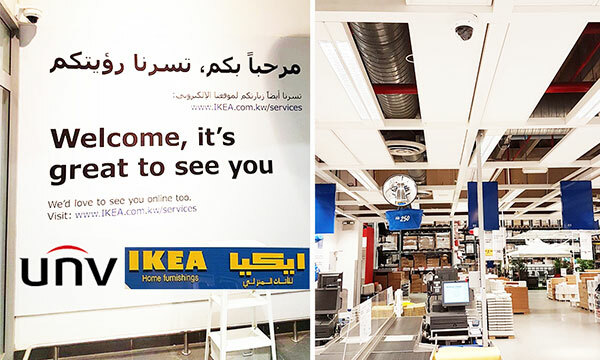 In IKEA Kuwait, these problems are all handled by Uniview products and solution. IKEA was founded in Sweden in 1943 and headquartered in Netherlands. It has 389 stores in 48 countries (as of August 2016). IKEA store is popular in the world because of its modernist designs for various types of appliances and furniture. Its pursuit of caring for peole and planet echos with Uniview’s brand value “Better Security, Better World”. In 2017, IKEA Kuwait store installed Uniview high quality products and system. Uniview provided a whole video surveillance solution. 320 IP cameras are installed in IKEA, covering the whole shopping areas, elevators, aisles, control room, parking lot, entrances and so on. The high-end 4MP motorized bullets and motorized domes are adopted in the solution. In the central control room, Uniview cameras can perfectly connect to a third-party platform, giving users unexpected results. 1. Swift and sharp focusing: Due to high quality components and optimized arithmetic, after adjusting the zoom, customers can get clear image immediately. 2. Wide temperature: UNV cameras installed in IKEA can work well with up to 60°C extreme environment temperature, suitable for middle east. 3. Hardware design: NVR308-64R-B adopts industry level PCB board. And it can support hot swap due to special front panel design. 4. Excellent compatibility: As one of Onvif Full members, UNV cameras work perfectly with Milestone and Dell storage server. Besides of retail stores, Uniview is covering more industries including world-class hotels, shopping malls, city surveillance, banks, hospitals, educations, factories etc. Uniview is dedicated to provide high quality products for global customers. © 2019 SecuSafe Pty LTD. All Rights Reserved.